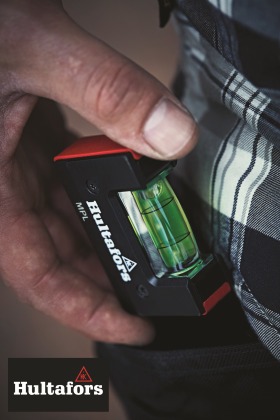 The new mini pocket spirit levels From Hultafors Tools are now available in the UK with a modern design, clear-focus vials for levelling work in tight spaces. The ergonomic design includes a crush-proof vial with a +60% magnifying effect and luminescent effect for easy reading in light or dark conditions. There’s also a strong protective casing and the magnetic version is ideal for accurate vertical measuring. Both new models look great and, added to all the other products in the Hultafors’ range, there’s something to suit every conceivable levelling requirement, says the company. For more information on the Hultafors Tools range of Spirit Levels, call the helpline below or download a digital catalogue from the website.